Optionally, moisten the rims of two martini glasses with the edge of the grapefruit quarter, dip the rims in sugar, and set aside. Squeeze the grapefruit quarter into the cocktail shaker. Add the vodka and elderflower liqueur. Shake briskly for 10-15 seconds and serve in martini glasses. 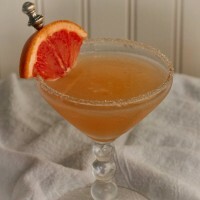 Bartender’s hint: Look for a fresh grapefruit that is heavy and soft so that it yields plenty of juice. When squeezing the grapefruit quarter into your shaker, if it seems like you’re only getting a trickle of juice, you may need to add a bit more of the bottled juice to your grapefruit martini.